The 1990 book Friday Night Lights: A Town, A Team, And A Dream, by H. G."Buzz” Bissinger examined the symbiotic relationship between the community of Odessa, Texas and the Permian Panthers high school football team that became a focus of so many hopes and dreams in the 1988 season. The book angered many residents of Odessa, but it became a best seller in the rest of the country, and was optioned to be produced as a movie. Inspired by the popularity of the book, but unable to get the rights, NBC produced a TV series called Against the Grain (1993), which featured Ben Affleck, of Dazed and Confused (1993) as the quarterback of a high school football team in Texas. It was filmed in California, and only lasted from October to December in 1993. In October 2004, 14 years after the book was first published, the Friday Night Lights movie, directed by Peter Berg was released. The film starred Billy Bob Thornton as Coach Gary Gaines, with Connie Britton as the coach’s wife, Sharon. The film, set in 1988 and shot all around Texas, also featured Brad Leland as John Aubrey, an enthusiastic booster club member. The movie received generally positive reviews and was a modest success in theaters and on home video. Fortunately for TV fans, the movie was successful enough that by January 2006, NBC had announced that Kyle Chandler would be playing the coach in a planned Friday Night Lights TV series. 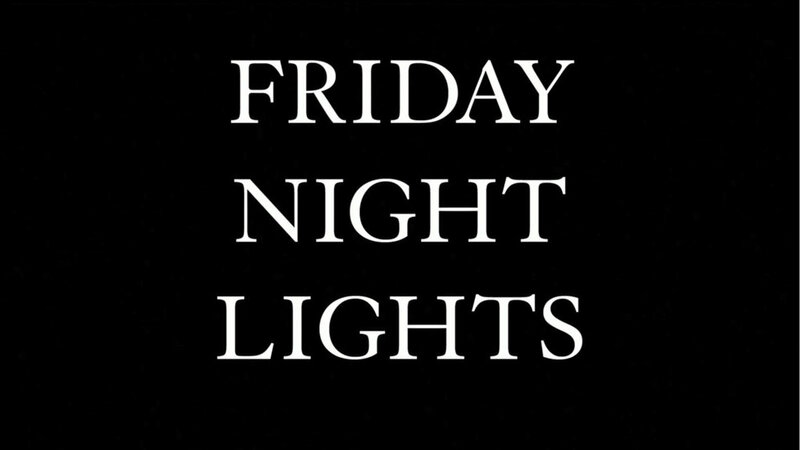 Friday Night Lights © 2006 NBC Studios, Inc. The first episode of the Friday Night Lights series, which aired on October 3, 2006, is simply titled "Pilot." In television production, a pilot episode serves as a sample offered to television networks in the hope that the network will request more episodes. It often serves as the introduction to a proposed series and, if the pilot is successful, it will be broadcast as the first episode of the series, as happened here. Rather than continue the story of the Permian Panthers, the TV version of Friday Night Lights (aka FNL) picks up the action from the book and movie, and makes different plays. Transporting the action to fictional Dillon, Texas gives the filmmakers leeway to explore similar themes without being bound by the lives of real people. The Friday Night Lights series was set in a fictional Dillon, Texas, but the show filmed primarily in and around Austin, Texas. SPOILER ALERT: The descriptions below include plot points of the film. If you haven't seen the series, you can buy the Friday Night Lights: The Complete Series DVD set on Amazon. The episode begins on a Monday morning as the sun rises over power lines and industrial areas of Dillon, Texas. On the radio, a host announces “Good morning, West Texas,” and begins a discussion of the Dillon Panthers football team. Unfortunately, I haven’t figured out where these shots were filmed. The Friday Night Lights movie was partially filmed in Odessa, Texas, where the real-life events took place, and these views bear some resemblance to that area. If you know, please contact me. Coach Eric Taylor (Kyle Chandler), the new head coach of the Panthers football team, surveys the terrain of Herrmann Field, the team’s stadium. Later in the episode, the team plays a dramatic game here on their home turf. Reference: The location of the fictional Herrmann Field, named for the real-life Pflugerville coach George Herrmann, is readily available all over the Internet. As dawn breaks, Tim Riggins (Taylor Kitsch) is awakened by his brother, Billy Riggins (Derek Phillips) in their home. Unfortunately, I haven’t determined the location of the Riggins house seen in the pilot. The house is clearly a different location than the Riggins house seen in the rest of the series, but this house is featured in the opening credits for the rest of the first season. If you know where it is, please contact me. The Riggins house from Friday Night Lights - © 2006 NBC Studios, Inc.
We're introduced to Matt Saracen (Zach Gilford) in the home he shares with his grandmother (Louanne Stephens). Exclusive: This home, which is only in the pilot episode, is located at 102 Walnut St E, Pflugerville, TX 78660. Reference: I was eager to find this location because it is featured in the opening credits for the rest of the first season, even though the Saracens are shown living in a different house in the rest of the series. I haven't seen this location listed anywhere else on the Internet, despite extensive searching. I finally located the house after determining that the house was probably in Pflugerville, because so much filming took place there, and then, I guessed that the buildings across the street might be in the downtown area. When I went to confirm the location, I met Joanna Gutierrez, who was visiting her family, including her father “Shorty” Gutierrez, and she very graciously showed me around the outside, shared some stories from the filming, and even let me peek into the front room where we first meet “Grandma Saracen.” I am extremely grateful for the time that the Gutierrez family shared with me, and for their permission to post photos of their home. We’re introduced to another family getting ready for the day, inside their large suburban home. We’ll later come to know them as cheerleader Lyla Garrity (Minka Kelly) along with her father Buddy (Brad Leland, in a role similar to his character in the film) and mother Pam (Merrilee McCommas). Unfortunately, I haven't determined the location of this Garrity house, which is seen only in the pilot. If you know where it is, please contact me. The Garrity house from Friday Night Lights - © 2006 NBC Studios, Inc.
Football players and other students hang out at a local diner, where star quarterback Jason Street enjoys the "Aztec Burger." 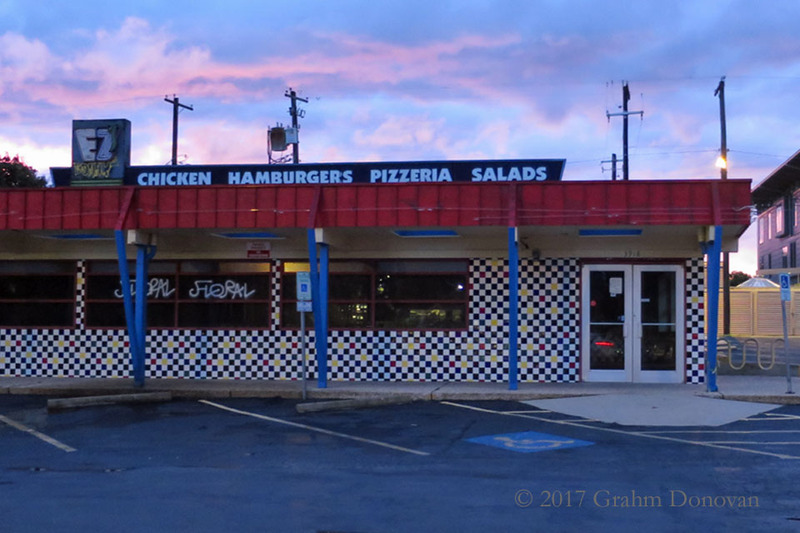 The diner location, which is seen several times throughout the first season, was an EZ's Brick Oven and Grill, 3918 N Lamar, Austin, TX 78756, but the location has since closed due to a fire, and the site is scheduled to become a Rudy’s “Country Store” and Bar-B-Q in the Spring of 2018. Reference: The diner location can be found on the "Friday Night Sights" site, and various online sites. Coach Eric Taylor, his wife Tami (Connie Britton) and their daughter Julie (Aimee Teegarden) live in a comfortable house in the suburbs, but they're looking for a new home as Eric assumes the head coach role. Unfortunately, I haven't determined the location of Taylor house seen in the pilot. If you know where it is, please contact me. The Taylor house from Friday Night Lights - © 2006 NBC Studios, Inc.
One of the many transitions between scenes features a quintessential Texas view; a church and a water tower. 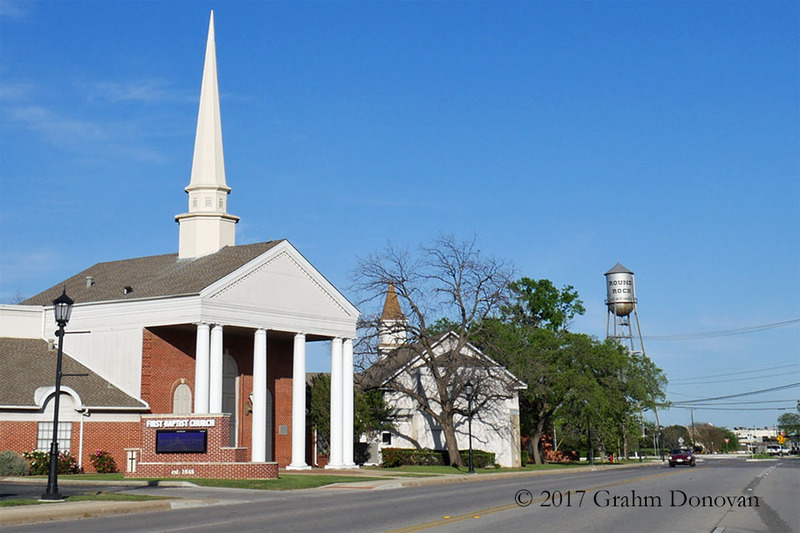 This particular church is the First Baptist Church Round Rock, 306 Round Rock Ave, Round Rock, TX 78664. Reference: I located this site based on familiarity with the Round Rock area. Another transition shows a football stadium with a large letter "H" on each end of the press box. Exclusive: This stadium, which is seen in the opening credits for the rest of the first season, is located at Hutto High School, 101 Farm-to-Market Road (FM) 685, Hutto, TX 78634. Reference: I located this when I figured out that the two large Hs must stand for the "Hutto Hippos," due to the local mascot. Hutto is known for the hippopotamus statues that are popular around the town. I haven't seen this location listed anywhere else on the Internet. At the grand opening of Buddy Garrity's new car dealership, the Panthers gather for a pep rally hosted by the Dillon's Mayor Lucy Rodell (Libby Villari). The dealership is really Capitol Chevrolet, 6200 Interstate Highway 35, Austin, TX, 78745. Reference: This location is readily available online from various websites, with most referring to it as Garrity Motors. In Season 1, Episode 19: "Ch-Ch-Ch-Ch-Changes," a commercial uses the name of the Buddy Garrity Auto Dealership. Another drive-by shot between scenes shows a large propane tank in the middle of a field. The scene was filmed on the street near 15420 FM 1825, Pflugerville, TX 78660, across the street from an O'Reilly Auto Parts store. Exclusive: I located this site based on recognizing the red and white tower. I haven't seen this location listed anywhere else on the Internet. On game day, local businesses show Panther pride with banners and cards in their windows. Exclusive: Some of the businesses shown are located at 100 Block of East Main Street, Pflugerville, TX 78660. I haven't seen this location listed anywhere else on the Internet. I haven't seen this location listed anywhere else on the Internet. One of the business that is closed for the Panthers game is Twisters, a local ice cream stand. The real ice cream stand is located at 2700 Pecan St W #950, Pflugerville, TX 78660. The ice cream stand is featured in the opening credits for the rest of the first season. There are many similar former Twistee Treat locations across the U.S.
Reference: This spot can be found on the "Friday Night Sights" site, and various online sites. The stadium lights from Friday Night Lights - © 2006 NBC Studios, Inc.
As the big game approaches, the stadium lights turn on against the skyline. Exclusive: For the first three seasons of the series, these lights are featured in the opening credits with the title between the lights. The shots of these stadium lights are actually from the Friday Night Lights movie, and they're located in the Ratliff Stadium, 1860 E. Yukon Road, Odessa, TX 79762. Reference: I recognized the lights from watching the film. I haven't found this connection listed anywhere else on the Internet. On Friday evening, the streets of Dillon, Texas are almost empty as the whole town heads to the big football game. 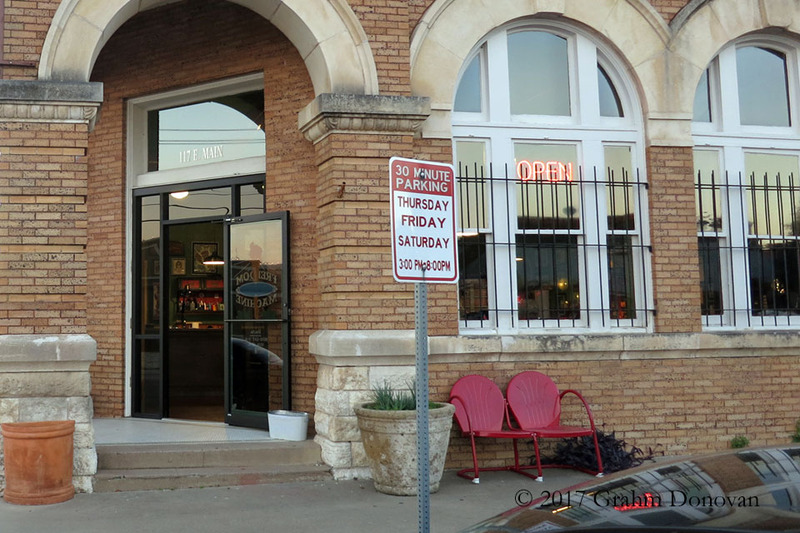 Exclusive: The intersection is located at approximately 200 North Main Street, Taylor, TX 76574. Reference: I recognized the "KINCL" sign from my familiarity with the area. I haven't found this listed anywhere else on the Internet as a filming location. The rest of the first episode of the series is focused on a crucial high school football game, and is filmed in the stadium.